Heidi: My heart has always pulled me toward nature and wilderness. This, coupled with my desire to explore and understand new places and things has brought me to the life I am currently living: exploring the beautiful wild trails, waters, and forests of America and the World. The conventional suburban life never felt right to me and it will always be there if I want it back. For now, we live a freer, more adventurous life aligned with our values. John: I’m a writer, blogger, and full-time adventurer. Along with my wife Heidi, we have begun roaming the United States in our ultra-light, ultra-small Scamp travel trailer. We believe in living purposefully, and focusing on what we do, rather than what we have. While we are relatively new to the full-time adventuring business, traveling light, efficiently, and relatively inexpensively is paramount to our ongoing success! With all this, we hope to inspire and help other dreamers grasp the life they desire through our experiences at libertybychoice.com. Heidi: I love exploring northern Minnesota, our home state. The possibilities are endless there, and perfect for outdoor adventures of all kinds. I personally enjoy the North Shore area of Lake Superior and the Superior National Forest just northwest of the shore. The trails are rugged and beautiful; the lakes are clear and plentiful, and the animals are wild and free. I could be happy there the rest of my days, but we choose to explore! John: It has to be the South Island of New Zealand. We recently returned from a month’s sojourn. As outdoor enthusiasts, this place is really difficult to beat. Within a day’s drive, you could hike white-sand beaches, rainforest, rolling countryside, glaciers, and alpine terrain. When you add in the wide variety of local brews and amazing dining experiences, New Zealand will always have a special place in my heart. Darn Tough Light Hiker Socks: These amazing wool blend socks have opened new doors for me and my feet! I’ve tried many brands of wool socks and these are by far the best. Besides the well known benefits of wool, these socks are guaranteed for life or your money back. They are also seamless which make them more comfortable than the competitors. REI Stormrealm Rain Jacket: This jacket has enabled me to enjoy so many outdoor adventures that would have otherwise been spoiled by the almighty Mother Nature. It is waterproof and windproof up to 50mph. This jacket is also highly versatile. It can be thrown on over my down jacket or fleece layer to further protect from wind and rain. Travelon Waist Pouch Travel Wallet: I purchased this gem for our month long trip to New Zealand, not wanting to drag a bulky purse along with me. This thing is great. I can’t lose it because it’s literally attached to me. It holds all my essentials: passport, debit/credit cards, cash, lip balm, and ID. Bonus: It’s unnoticeable under my clothes, unlike the infamous fanny packs of the 90s. I still use it today, no purse for this girl! ExOfficio BugsAway Baja Sur Shirt: This is the only shirt you need if you find yourself heading into a bug-infested jungle, an airport terminal, or anywhere in-between. 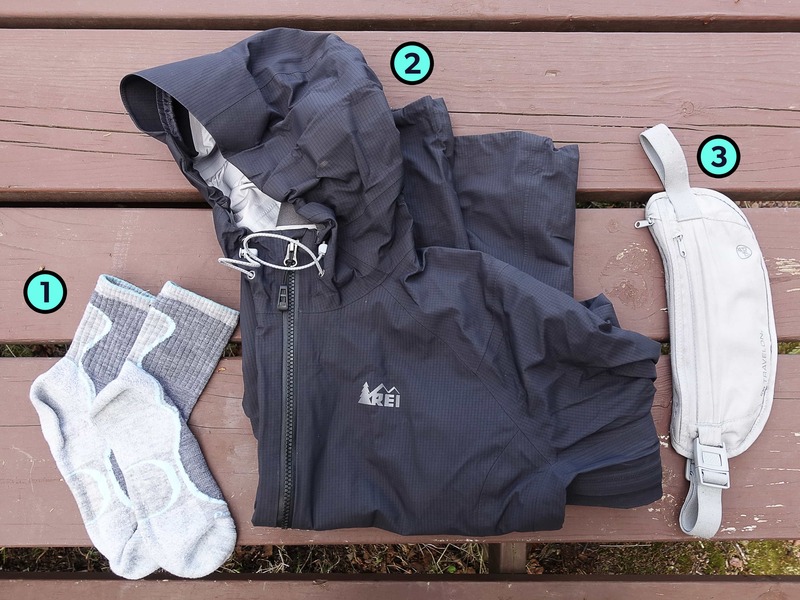 It is lightweight, easy to wash and dry, and well ventilated for when you are breaking trail in the Boundary Waters, or trying to outrun the sandflies of New Zealand. It features a security pocket, amongst others, to keep all your pack-hacking gear close at hand. Not to mention it is comfortable, and gives you that aura of a well-travelled individual – beard optional. Paper Mate Profile Retractable Ballpoint Pens: I take these lifesavers everywhere I go. It is the pen I have used exclusively since my college days. They are light, incredibly affordable, and seem to last forever. From writing gate changes on my hand (old school) to piecing together our first book, this pen can take you as many places as you take it. Just be sure to have a couple on hand – as soon as you lend it to someone, you won’t be getting it back! Polypropylene Rope: Any gauge, any length you have the space for. I’ve now seen it marketed as survival bracelets, which may be a good solution for the minimalist traveler. It has built shelters, held down gear in torrential rain and winds, used as a clothesline, solved emergency repairs, and has even entertained in the form of learning new and useful knots. You’ll use it for solutions you need in a pinch. Always have a bit on you! If traveling as a pair, which we do, pre-book your seat selection (if applicable) for both the aisle and window seats. This increases your probability of having that gloriously open middle seat. If luck doesn’t strike, that middle person will usually gladly be willing to switch out to the aisle or window. Or you could barter with them using a free drink. Self-cleaning clothes. We have ways to facilitate washing, but finding a way or taking the time away from your epic adventures in stale laundromats can be a buzzkill. Especially if you have to hunt down exact change. Just let me put my clothes in a sealed bag, hit a button, and dispense a clean and dry outfit. Can we please get that going, scientists? Heidi: While traveling and living in our Scamp trailer I find myself missing a good cup of filtered coffee. The lack of electricity and space in the Scamp makes it nearly impossible to have a coffee maker. We currently resort to instant coffee for our daily caffeine fix. Also, when traveling outside the US, I’ve noticed espresso wins out over filtered coffee. John: Our Wenonah canoe. I love that we have it parked next to us now, but there have been too many times I’ve witnessed pristine glass waters that needed a good paddling. Lake Wanaka in New Zealand was a good example. Perhaps I could try checking it? Seventeen feet of Kevlar wouldn’t be the most egregious item I’ve seen in my travels. John: For me personally, it’s a shaving razor. I know there’s an extreme unlikelihood I will use it on travels, but it’s there as somewhat of a safety blanket. You never know when an impromptu meeting or interview might spring up on you on a backcountry trail. While those cases are unlikely, my Dollar Shave Club Executive is always there for me. Perhaps it is my link to a more civilized environment. A portal to a clean-cut, professional John. The Modobag—a motorized suitcase. If you own one, you know you don’t need it. If you happen to be physically challenged or injured, you can get assistance almost anywhere you need to be, especially in the United States. You won’t make it up an incline or on a rough surface. You may even draw a few chuckling bystanders, and not to mention, it is a legal liability knowing you may hurt yourself or others. 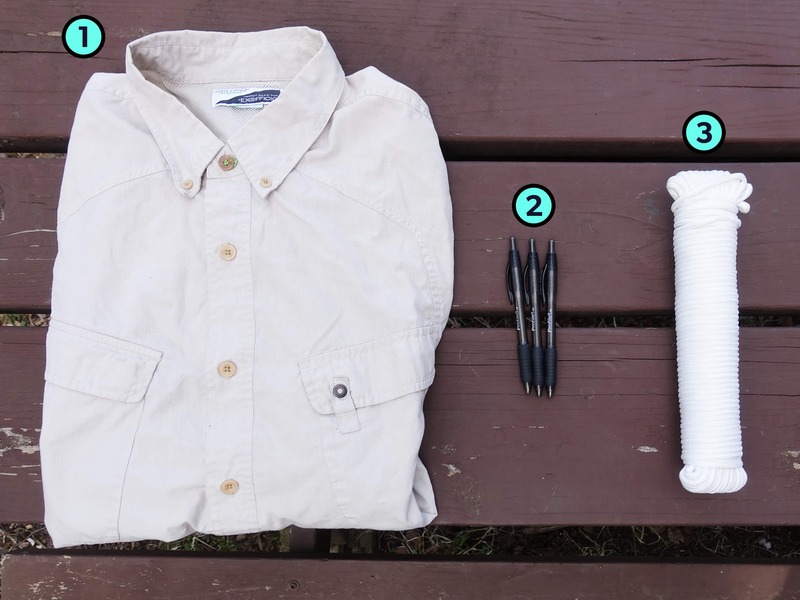 Heidi: One packing tip for extended overseas traveling: less is more. Personally, I'm extremely glad I realized this before our month long trip to New Zealand. This is where good clothing materials like wool, and treated (anti-microbial) synthetics become extremely important. With these materials you can go longer between washing, therefore require less washing and less outfits. John: My advice is if you are connecting flights, especially internationally, don’t necessarily shoot for the fastest route. At minimum, your layovers should be 2 to 3 hours. Flight delays, de-icing, long lines, and overzealous security agents can strike at any moment. We are better equipped for dealing with boredom than stress. Those couple extra hours may very well save you several more, if not days. You can keep up with Heidi and John on their website, Liberty by Choice. Awesome article, with great tips! !